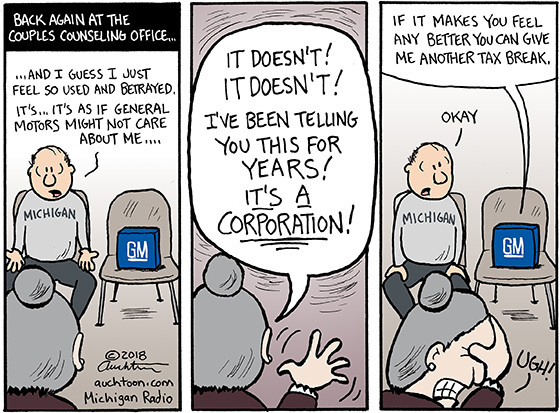 I wouldn’t say Michigan’s relationship with General Motors is dysfunctional. I think it’s more a case of unrealistic expectations. The auto industry is an integral part of our Michigan identity. So we, as people, tend to take it personally when GM does something that affects Michigan people negatively such as the plan announced this week to layoff workers and close plants in Hamtramck/Detroit and Warren. It seems harsh, yes. Thankless. And one could even argue needlessly cold — why can’t they just say “we are closing the facility” instead of “we will no longer allocate product,” which makes it sound like they are going to to death? But in the end, GM is a corporation doing what corporations do, which is what is best for them. Always. This again demonstrates the importance of electing legislators who actively prioritize people interests. In the meantime, I suggest we take advantage of the opportunities generated by a healthy GM, but give up the idea that it will in any way be the “Generous Motors” of yore. Corporations are not people (no matter what the US Supreme Court says), so we shouldn’t expect them to act like people.